Evaporative coolers or swamp coolers are a popular and energy-efficient cooling strategy in dry climates of the United States. Hot outside air enters the swamp cooler. The air passes over water-saturated pads, and the water evaporates into the air. The energy used removes heat from the air. The 15- to 40-degree-cooler air is then directed into the home, and pushes warmer air out through windows. Because this process also humidifies the air, swamp coolers are best used in areas with low summertime relative humidity. Evaporative coolers use less than one-third the energy of air conditioners, and cost about half as much to install. Unlike central air conditioning systems that recirculate the same air, evaporative coolers provide a steady stream of fresh air into the house. Evaporative coolers are rated by the cubic feet per minute (cfm) of air that they deliver to the house. Most models range from 3,000 to 25,000 cfm. Manufacturers recommend providing enough air-moving capacity for 20 to 40 air changes per hour, depending on climate. Evaporative coolers are installed in one of two ways: the cooler blows air into a central location, or the cooler connects to ductwork, which distributes the air to different rooms. Central-location installations work well for compact houses that are open from room to room. Ducted systems are required for larger houses with hallways and multiple bedrooms. Most people install down-flow evaporative coolers on the roofs of their houses. However, many experts prefer to install ground-mounted horizontal units, which feature easier maintenance and less risk of roof leaks. 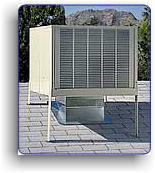 Small horizontal-flow coolers are installed in windows to cool a room or section of a home. These portable evaporative coolers work well in moderate climates, but may not be able to cool a room adequately in hot climates. Room evaporative coolers are becoming more popular in areas of the western United States with milder summer weather. They can reduce the temperature in a single room by 5 to 15 degrees. An evaporative cooler should have at least two speeds and a vent-only option. During vent-only operation, the water pump does not operate and the outdoor air is not humidified. This lets you use the evaporative cooler as a whole-house fan during mild weather. Control the cooler's air movement through the house by adjusting window openings. Open the windows or vents on the leeward side of the house to provide 1 to 2 square feet of opening for each 1,000 cfm of cooling capacity. Experiment to find the right windows to open and the correct amount to open them. If the windows are open too far, hot air will enter. If the windows are not open far enough, humidity will build up in the home. You can regulate both temperature and humidity by opening windows in the areas you want to cool, and closing windows in unoccupied areas. Where open windows create a security issue, install up-ducts in the ceiling. Up-ducts open to exhaust warm air as cooler air comes in from the evaporative cooler. Evaporative coolers installed with up-ducts will need additional attic ventilation. Filters remove most of the dust from incoming air—an attractive option for homeowners concerned about allergies. Filters can also reduce the tendency of some coolers to pull water droplets from the pads into the blades of the fan. Most evaporative coolers do not have air filters as original equipment, but they can be fitted to the cooler during or after installation. Save yourself a lot of work and money by draining and cleaning your evaporative cooler regularly. Build-up of sediment and minerals should be regularly removed. Coolers need a major cleaning every season, and may need routine maintenance several times during the cooling season. The more a cooler runs, the more maintenance it will need. In hot climates where the cooler operates much of the time, look at the pads, filters, reservoir, and pump at least once a month. Replace the pads at least twice during the cooling season, or as often as once a month during continuous operation. Some paper and synthetic cooler pads can be cleaned with soap and water or a weak acid according to manufacturer's instructions. Filters should be cleaned when the pads are changed or cleaned. Caution: Be sure to disconnect the electricity to the unit before servicing it. HomeSmart from Xcel Energy offers appliance repair and replacement plans to ensure your cooling system runs properly. You can customize your coverage to include preventive maintenance. Two-stage evaporative coolers are newer and even more efficient. They use a pre-cooler, more effective pads, and more efficient motors. They don't add as much humidity to the home as single-stage evaporative coolers, but are still much more efficient than air conditioners. It is best not to use evaporative coolers in humid climates because they add moisture, or humidity, to the air. Also, they will cool your house down but not as well as an air conditioner, because of the added humidity. They require maintenance about once a month. If the cooler is installed on the roof, there is some roof deterioration caused by routine maintenance trips. A sunlit rooftop cooler will be about 1 degree Fahrenheit less effective than a shaded cooler. Rooftop maintenance also requires using a ladder, which may be an inconvenience. Source: U.S. DOE, Energy Efficiency and Renewable Energy Network, Consumer Energy Information: EREC Reference Brief Cooling Your Home with Fans and Ventilation. EREC is operated by NCI Information Systems, Inc. for the National Renewable Energy Laboratory/U.S..Department of Energy. The content of this brief is based on information known to EREC at the time of preparation. No recommendation or endorsement of any non-U.S. Government product or service is implied if mentioned by EREC. Copyright © Aclara Technologies LLC. All Rights Reserved.